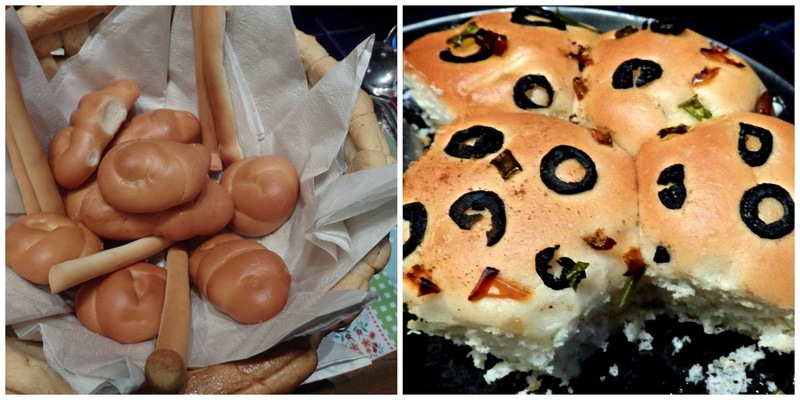 Pat Chapman is in India grilling up a storm. 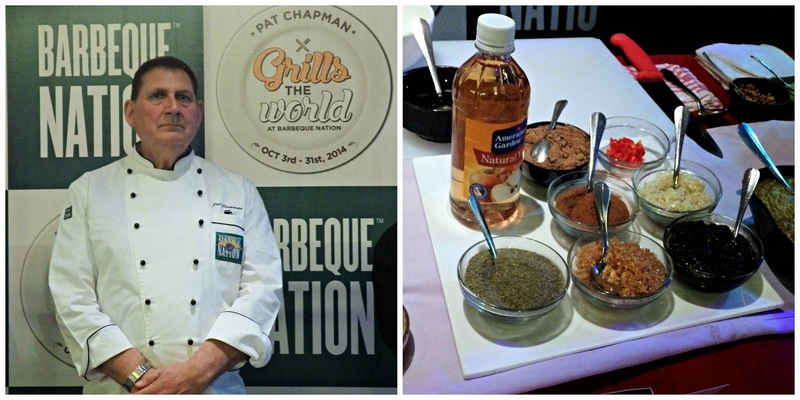 At the food festival titled "Pat Chapman Grills the World", he is showcasing 14 of his new marinades at various Barbeque Nation restaurants across the country. The effervescent chef was at the Vadapalani branch of the restaurant chain on Thursday night, doing what he loves best - spicing up food. The new marinades are named after various countries and the particular ingredients they are known for - horseradish from the British Isles, poblano chilli from Mexico, jerk marinade from Jamaica etc. I was invited to review the demo and the dinner, the highlight for me was meeting the chef. After all, who hasn't heard of the Curry King of the UK who "baltified" Britain? Walk into the cookery section any bookshop and you will find on the shelves books written by him on... what else but curry! Thanks to the rain and the horrible traffic, we almost missed the show. The entrance to the restaurant was through a slightly seedy corridor but the restaurant itself was warm and welcoming. On the walls hung small flags of the countries the special ingredients represented and that lent a festive air to the whole space. On a large table in the middle of the restaurant, components for the marinades were laid out and behind it stood Pat Chapman and his assistants. Just about all the diners and the staff at the restaurant stood around, cameras in hand. The emcee made the necessary introductions and the show got underway. 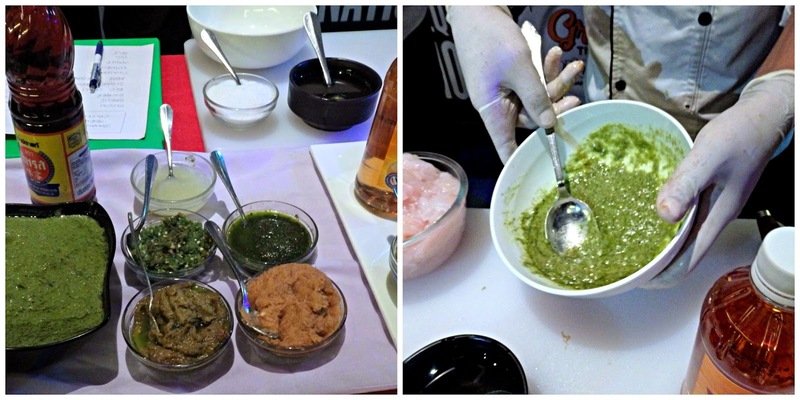 Three marinades were to be demonstrated at this session so the ingredients for the jerk chicken marinade - chopped onions, muscovado sugar, apple cider vinegar and other spices and condiments were measured into a mixing bowl. Chicken drumsticks were coated with this marinade, pushed onto skewers and then taken off to be cooked. The second marinade was Mighty Hot Mai Tai fish. Basa fish slices were marinated in a paste of green chillies, lemongrass, basil, fish sauce and oil. No rum in it though! Threaded onto skewers, they too were dispatched to the kitchen. The third marinade was Arabian inspired with powdered black and white sesame seeds, tahini paste, pepper and olive oil. Bright green broccoli florets were coated with this interesting mix and the chef told us how to blanch the florets without losing that beautiful colour. He also emphasised that it was best to use extra virgin olive oil. Being a live show, the presenter went around the tables asking questions about the restaurant and their signature dishes and even the countries whose flags hung on the walls. Those with the right answers were rewarded with gift vouchers. Then it was time to taste. A portable grill was embedded into our table, skewers with different marinated meats and vegetables were laid over it, some of the starters were served on the plates. 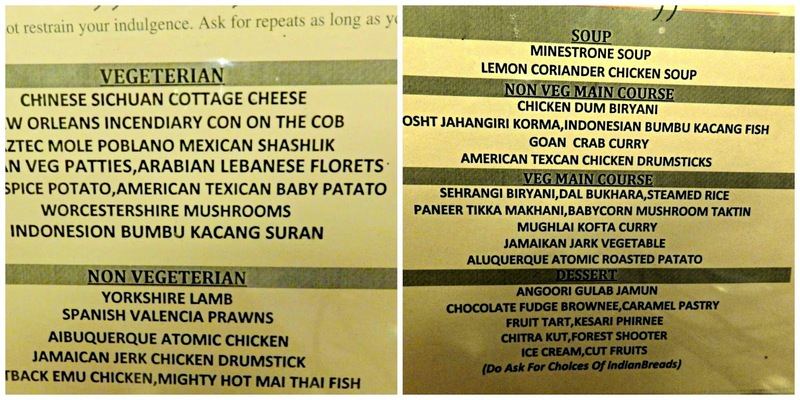 Nine vegetarian and 6 non vegetarian new flavours are listed on the menu. We loved most of the new marinades. My favourites were Spanish Valencia prawns, atomic chicken (it came with a heat warning but I didn't find it that spicy), Outback emu (not emu meat but chicken) and jerk chicken drumstick. The Persian veg patties were melt-in-the-mouth soft and the mushrooms were delightful. I particularly liked the broccoli coated with the Arabian Lebanese marinade and while I like my vegetables just done, I would have loved them more if those broccoli were a little more tender. What can I say about Barbeque Nation's signature Cajun spiced potatoes other than that they are utterly delicious. Without a doubt, the new marinades are a welcome change, but I felt that some of them tasted too subtle. Thai basil and fish sauce are strong flavours, I could not taste either on the grilled fish. As for the main course, the Texan chicken drumsticks had a lovely colour on them but they were too tangy. The Indonesian bumbu kachang too failed to deliver - the peanut flavour was merely hinted at while it needed to be the star of the dish. The Mangalore prawn curry was another delicious dish. It was the perfect accompaniment to both white rice and the selection of Indian breads. Chatting with Pat and his wife, he told us his interest in culinary matters was influenced by his grandmother. We also learnt that he had once been a pilot and that this is his 44th trip to India! There was a 2 man band playing live music and when he was asked to sing, Pat sportively got up to the stage and belted out Glen Campbell's 'Rhinestone Cowboy'. Needless to say, the crowd adored him. Now here's a chef who wears many hats. Getting an internationally renowned chef of Pat Chapman's calibre to enhance its diners' culinary experience, Barbeque Nation is indeed onto a good thing. Do catch the festival that is on till October 31st. Funny we have a foreigner teaching us how to curry :D and brand as huge a BBQ ended up hiring him to teach their chefs ROFL..